NEMA Type 12 Consoles/Operator Workstation Enclosures. Front Sloping Operator Interface Electrical Panel for Push Buttons and HMI's, by Saginaw Control. Designed to house electrical and electronic controls, instruments, and components. Provides protection from dust, dirt, oil and water. Consolets can be mounted on either of two sides to give a control surface inclined 30° or 60°. Can be mounted on desks, machines, or pedestals. ANSI-61 gray powder coating inside and out over phosphatized surfaces. 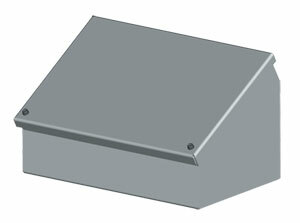 Pedestals and bases are ANSI-61 gray powder coating. E-Stop push button, red maintained 44mm twist-to-release heavy duty oil tight push button, with 1 NC contact block for 22mm hole.